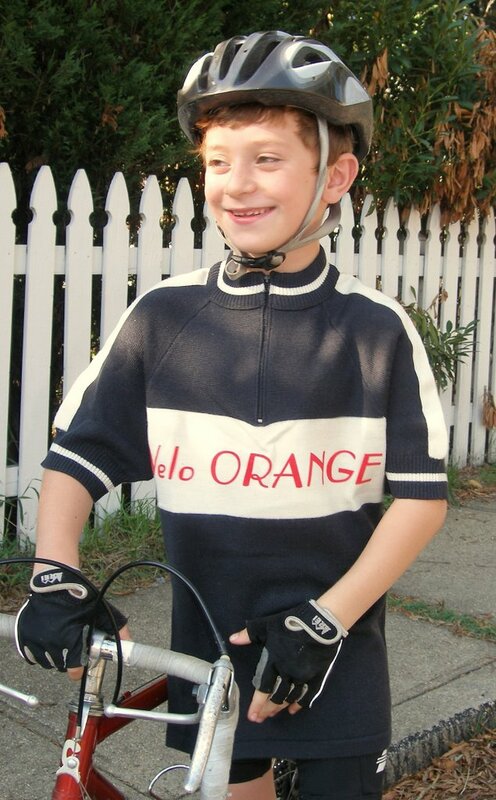 The Velo Orange Jerseys are here. 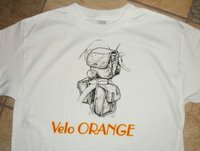 They are soft merino wool, dark grey with white panels, and have the Velo Orange script in red/orange. There are three back pockets and knit bands around the sleeves and neck. Wool is the ideal natural fiber for jerseys. It keeps the sweat away from your skin and doesn't feel cold and clamy when wet. Wool is also not prone to smell funky, like some synthetic fibers. The sizing is just a touch on the small side. Just a short note to say that I'll be at Interbike for most of next week. Interbike is one of the biggest bike trade shows in the world and a lot of manufacturers we might be able to buy from will be there. I particularly hope some of them are willing to make products to our designs. There will be someone here who can ship some orders, but not all. So if there is anything you need in a hurry, please order this weekend and I'll ship it on Monday. Anything special I should look for? Also, the T-shirts just came in. I'll post a photo and put them in the store soon. And the wool jerseys are due to arrive Monday. 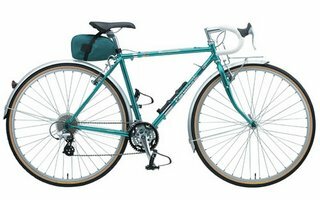 I've noticed a number of bikes made for the Japanese market that might appeal to this blog's readers. Unfortunately they are difficult or impossible to buy here. The Emperor Touring Master, on the left, is made by Maruishi. If you follow the link, note the instructions for packing it for rinko. The fenders are separable. Not bad for $745 complete with bell and fenders. 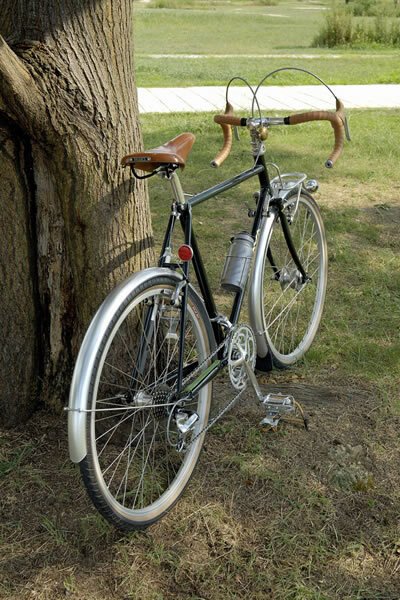 The Araya Randonneur is made by the same folks who make Araya rims. Check out the Brooks Saddle, lovely stem, generator hub, flashlight, and the front rack with light mount. It's well worth exploring the linked site. 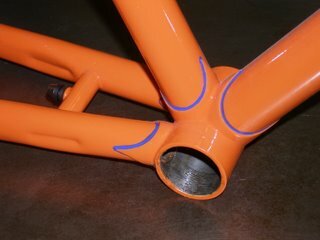 The frame details are first rate, right down to braze-ons for a rubber slap guard. By the way, this bike costs all of $1156. The Panasonic B-OSD2, below, has S&S type couplers allowing the frame to be separated into two parts. Like most of these bikes it has good quality components, Nitto bars and stem. It costs $1060 or a bit under $500 for the frame alone. 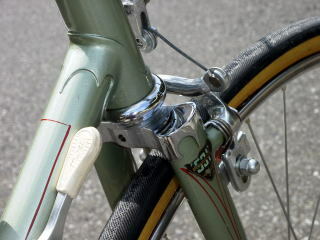 Panasonic also makes a similar bike without couplers, the B-OSC2. But it does have hammered fenders and lights. One of the big problems with these bikes, other than getting them, is that they are often not made in larger sizes. Andrew posted a link in the comments to Fukaya Davos bikes (photo below). This is a brand I was unfamiliar with, but I was impressed enough that I asked our import agent to try to arrange for us to get some. I don't know if his efforts be successfull, especially since I also asked for at least one larger size. But we'll know in a week or two. I don't suppose anyone knows what factory actually makes these? The Ostrich handlebar bags and saddle bags were delivered today and they can now be ordered through the store. We will start shipping them on Monday. If you haven't been following the Ostrich bag story, we wanted to find a brand of traditional and well made cyclo-touring bags that didn't cost over $200 apiece (like the famous French brand). 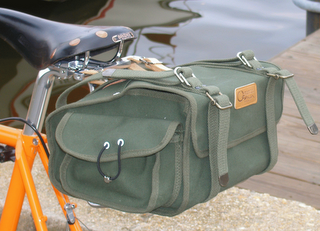 Ostrich handlebar bags have been made for over 50 tears using stout cotton duck and reinforced with leather and rivets. They may not be as fancy as the French bags, but they are very sturdy, well designed, and of excellent quality. My short review and additional photos of the of the bags are here. 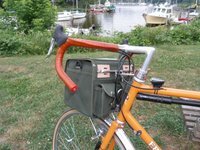 Alex Wetmore wrote a more detailed review of the handlebar bag and decaleur that can be found on his blog. 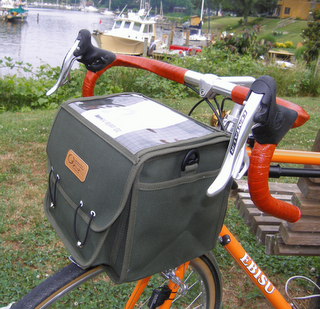 We also have the rain covers for the handlebar bags in bright yellow. 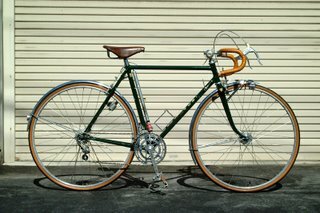 I was amused by David NJ and Neil Bergs good natured comments to the Rinko post as to the most beautiful bike they'd ever seen. The two bikes in question were a Toei Rinko Randonneur and a Toei "Demontable". One of my favorites is the Toei 50th anniversary bike on the left (more photos here). So why is it that Toei makes so many beautiful bikes? 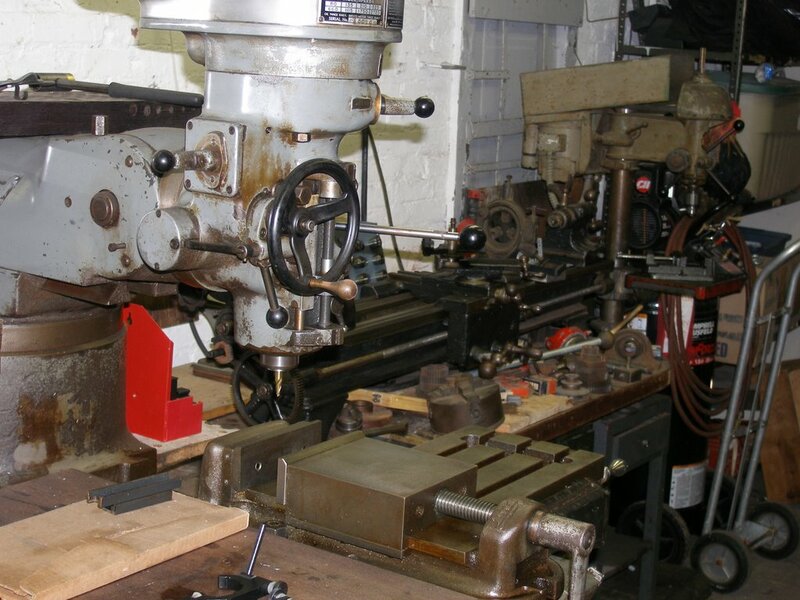 First off they have a lot of experience , having been founded in 1955. 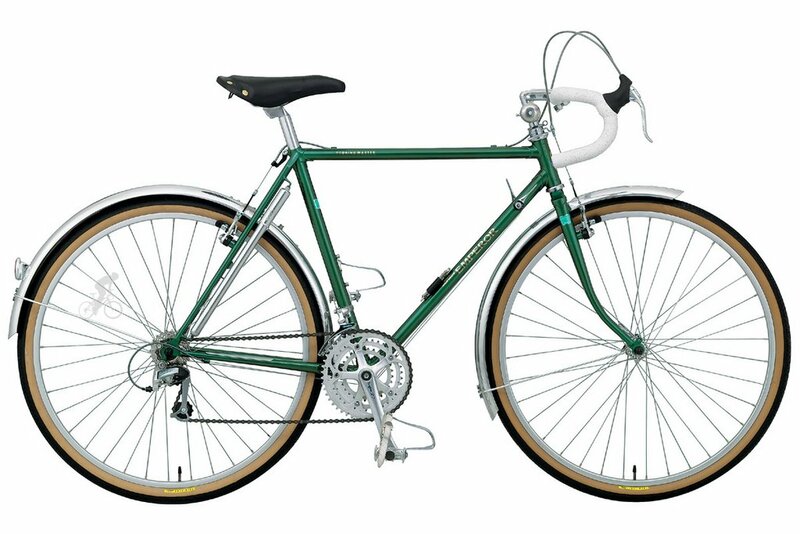 Like many Japanese bike companies they are obviously influenced by the best French bikes. And there is a certain restraint shown in the details and finish. They may be superbly done, but they are not over-done. I thought it would be fun to share some links to a few bikes I consider especially attractive and to urge anyone who cares to, to add a link to their choices in the comments. 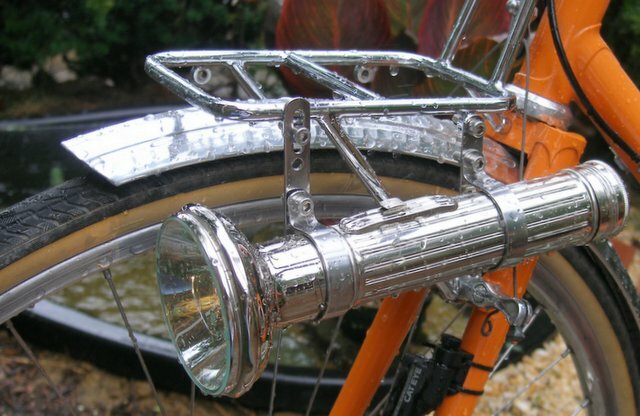 Who knows, we may get some ideas for the Velo Orange frames. By the way, I left off the bikes I've posted previously. This Toei camping bike. In fact every bike on this page is a candidate. Here are two more nice Toei bikes. Wanatabe is another fine Japanese builder. This Herse is very pretty. I always liked Grand Boise cycles. The racks on the Daudon give it special style. 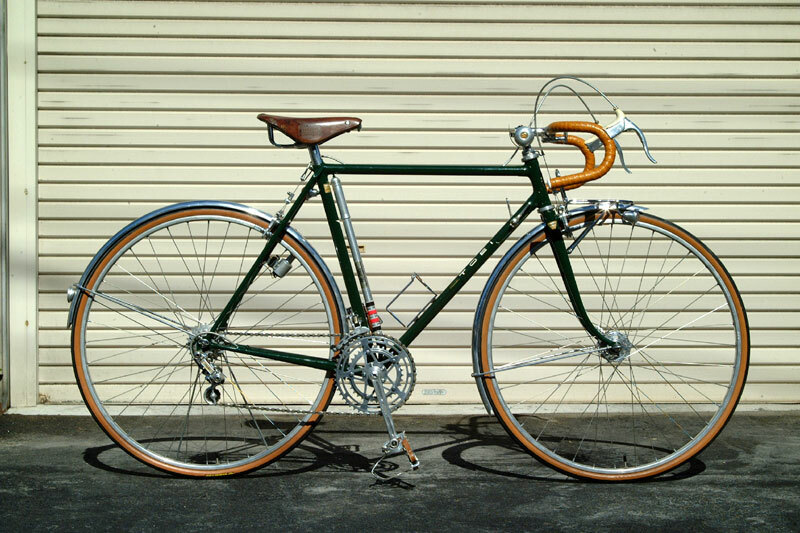 This 1966 Rene Herse racer is stunning. Okay, your turn. 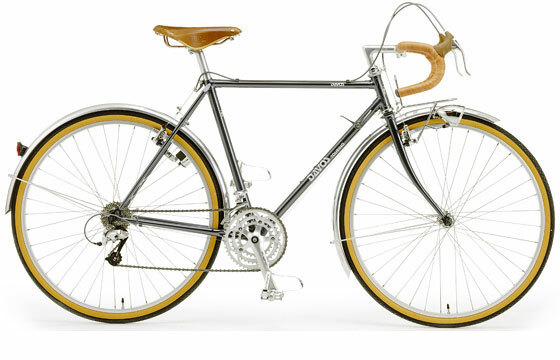 Please share a link to the prettiest bike you've seen on the web. Our front racks have been delayed. 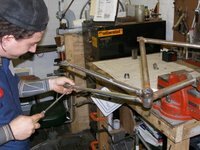 The shop that had been making our racks and decaleurs is inundated with work so we made a deal with a well known bike builder to make our front rack instead. We had hoped to have them within a few weeks, but when I called a few days ago I was told they hadn't started yet and might not for weeks. Having been in the boat building businesses in the past, I could not imagine that happening. It just seemed that everyone stuck to their word. I would buy containers of mahogany or hundreds of gallons of epoxy on a handshake, and they were delivered on time. If we had an order due on a certain date, the guys in the shop would work until midnight if need be. I would too, running a saw or a sander or just mixing adhesive. We'd order a dozen pizzas turn up the stereo and go to work. Then we'd sit around and drink beer until all hours and feel damn proud of ourselves. But since starting Velo Orange it seems that most of our suppliers can't get stuff to us on time. Shipments are delayed for weeks without even an apology. Incorrect parts are sent and the only excuse we get is "that's all we had". The fact that it does not work is not even considered. The price we were promised is suddenly meaningless. I don't get it. We pay our bills on time. I'm easy to get along with. We order in fairly large quantities. Why does nothing arrive on time? What is it with the bike business? Ostrich bags: These are on the way and will arrive any day now. Front racks: Two shops are interested in making them. I hope to have a sample in a week or two and production racks soon after. TA pedals: UPDATE: Just heard that the reason for the delay is a broken mold used to make the pedal bodies. A new one is being fabricated. 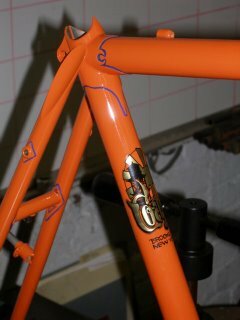 Custom Honjo Fenders: In 2-3 months. 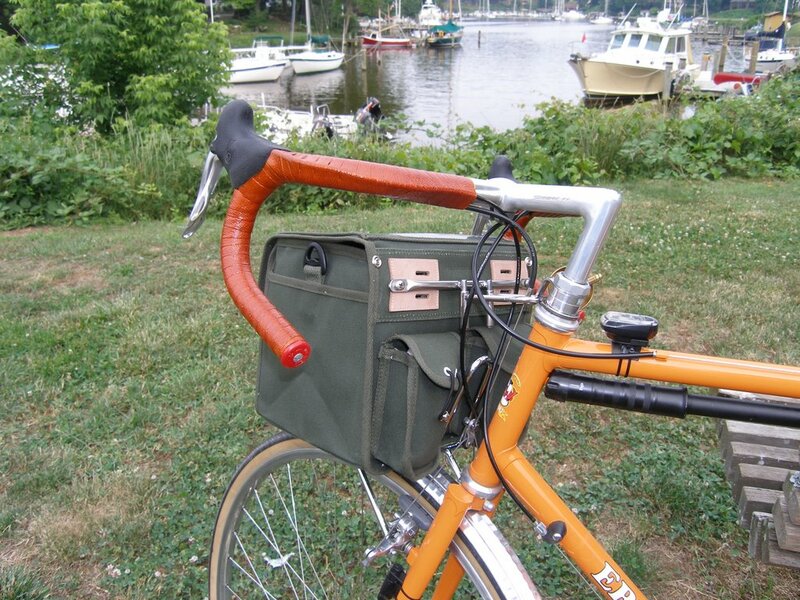 Velo Orange Handlebar Packs: I won't even try to predict. 1-inch Decaleurs: They are in production now, so about 2 weeks. 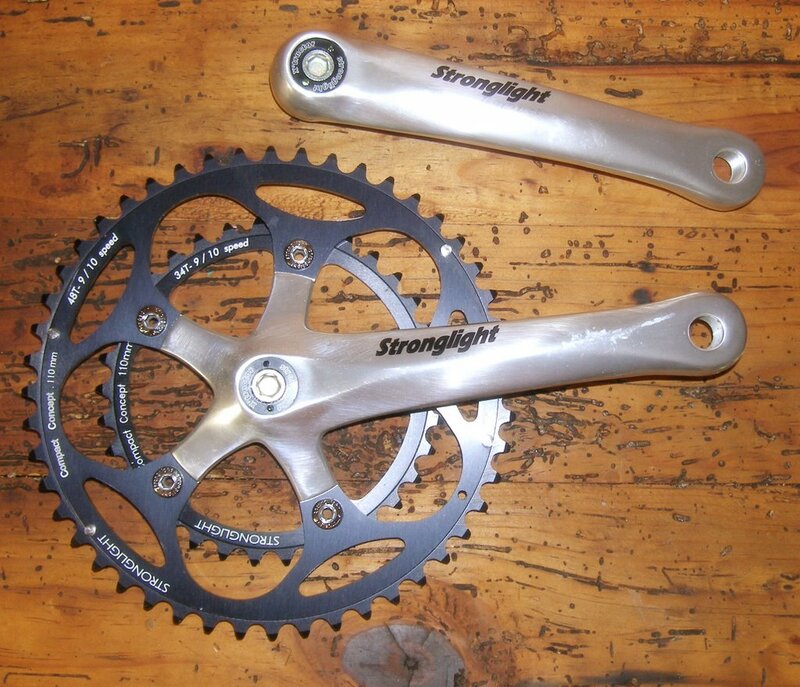 The long awaited Stronglight Impact cranks have arrived. They now come with auto-extractor crank bolts and the finish is really nice. The chainrings are black; that's all they had. Of course the chainrings are 10-speed compatible with the latest shifting features. So you can use them with the newest Campy or Shimano drivetrains, with your old 5-speed freewheel, or with anything in between. We have the proper bottom brackets as well. And for those of you who have the old classic Stronglight cranks, we now have a 23.35mm JA Stein crank puller. 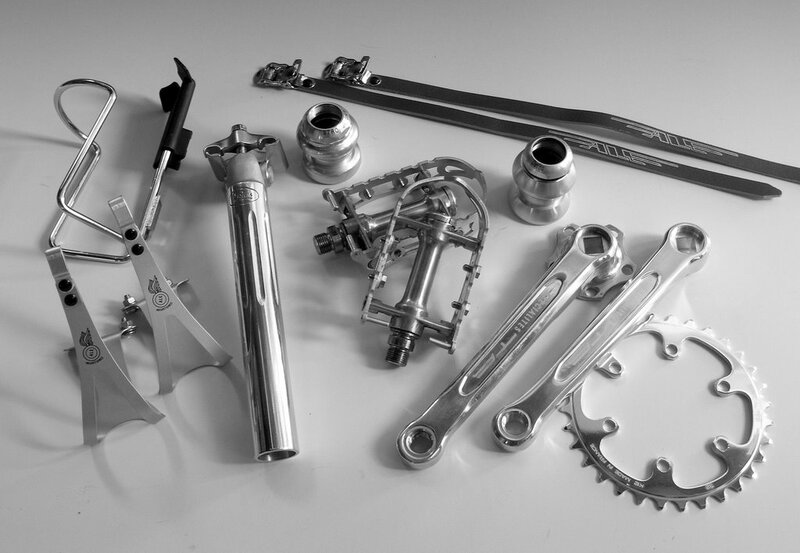 The Impact cranks have modern 22mm threads and those extractor bolts. So you don't need any puller for them. I was in Brooklyn New York this weekend visiting Johnny Coast's shop. Johnny is making the Velo Orange frames. Here are a few photos I took. The orange city bike was just out of the paint shop. 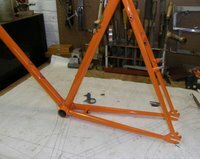 Johnny had a local guy do the lug lining which was only okay, but the workmanship on the frame is just outstanding. The orange paint is flawless too. Johnny says we can figure six months from order to frame delivery. That's about a quarter to a sixth of the wait from many builders. But it's still a long time. Of course many experienced riders say that once you get a made-to-measure frame you'll never go back to a stock frame, so it's worth it. We talked about the VO city bike. That's a very hard bike to spec. We're going to use the same geometry that Herse used. But deciding on the drivetrain is a challenge. I think we'll offer both a derailleur and a hub gear version. I've been promising to make a proper mount for our retro flashlight for months. Well it's finally done and just in time for short fall days. It's raining so hard that I haven't wanted to go for a ride to try it out, maybe tomorrow night. As soon as I test it (the prototype worked well) and figure out the exact price (about $16 probably), I'll put it in the store. The finger knobs on the prototype will also be available for those of you who want the option to remove the light quickly. It may not be quite as classy as the Herse original, but it should do. We've ordered up a run of short sleeve merino wool jerseys. They will be very dark grey, or slightly light black. "Velo Orange" will appear on a white band in art deco style red script (I know, I know; we couldn't get orange). This is just a small trial run so you may want to reserve your's. The cost will be $68 and they will arrive in late September. If they sell well, we'll do a run of long sleeve jerseys for late October. 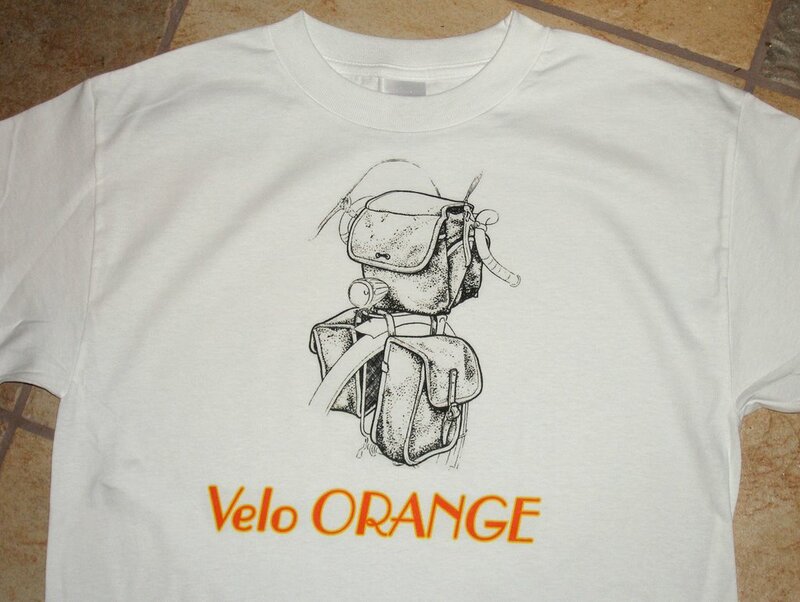 Velo Orange t-shirt with the Daniel Rebour drawing on the right will also be available. They will be white with orange script, as above. Finally, we now stock Brooks Champion Flyer saddles.